The massive decline of over 75% insect biomass reported from Germany between 1989 and 2013 by expert citizen scientists proves the urgent need for new methods and standards for fast and wide-scale biodiversity assessments. If we cannot understand species composition, as well as their diversity patterns and reasons behind them, we will fail not only to predict changes, but also to take timely and adequate measures before species go extinct. An international team of scientists belonging to the largest and connected DNA barcoding initiatives (iBOL, GBOL, BFB), evaluated the use of DNA barcode analysis applied to large samples collected with Malaise traps as a method to rapidly assess the arthropod fauna at two sites in Germany between May and September. One Malaise trap (tent-like structure designed to catch flying insects by attracting them to its walls and then funneling them into a collecting bottle) was set in Germany’s largest terrestrial protected natural reserve Nationalpark Bayerischer Wald in Bavaria. Located in southeast Germany, from a habitat perspective, the park is basically a natural forest. The second trap was set up in western Germany adjacent to the Middle River Rhine Valley, located some 485 kilometers away from the first location. Here, the vegetation is eradicated annually due to St. Martin’s fires, which occur every November. Their findings are published in the open access Biodiversity Data Journal. DNA barcoding enables the identification of a collected specimen by comparing its BIN (Barcode Index Number) against the BOLD database. In contrast to evaluation using traditional morphological approaches, this method takes significantly less experience, time and effort, so that science can easily save up on decades of professional work. 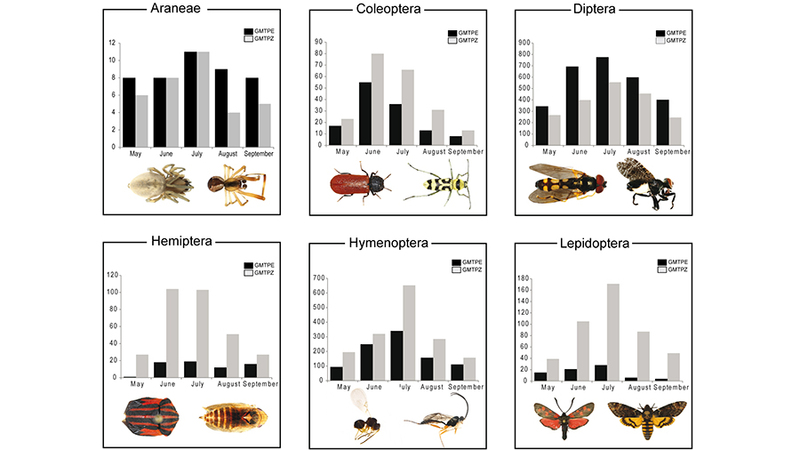 However, having analyzed DNA barcodes for 37,274 specimens equal to 5,301 different BINs (i.e., species hypotheses), the entomologists managed to assign unambiguous species names to 35% of the BINs, which pointed to the biggest problem with DNA barcoding for large-scale insect inventories today, namely insufficient coverage of DNA barcodes for Diptera (flies and gnats) and Hymenoptera (bees and wasps) and allied groups. As the coverage of the reference database for butterflies and beetles is good, the authors showcase how efficient the workflow for the semi-automated identification of large sample sizes to species and genus level could be. In conclusion, the scientists note that DNA barcoding approaches applied to large-scale samplings collected with Malaise traps could help in providing crucial knowledge of the insect biodiversity and its dynamics. They also invite their fellow entomologists to take part and help filling the gaps in the reference library. The authors also welcome taxonomic experts to make use of the unidentified specimens they collected in the study, but also point out that taxonomic decisions based on BIN membership need to be made within a comparative context, “ideally including morphological data and also additional, independent genetic markers”. Otherwise, the grounds for the decision have to be clearly indicated. The study is conducted as part of the collaborative Global Malaise Trap Program (GMTP), which involves more than 30 international partners. The aim is to provide an overview of arthropod diversity by coupling the large-scale deployment of Malaise traps with the use of specimen-based DNA barcoding to assess species diversity. Sequence analyses were partially defrayed by funding from the government of Canada through Genome Canada and the Ontario Genomics Institute in support of the International Barcode of Life project. The German Barcode of Life project (GBOL) is generously supported by a grant from the German Federal Ministry of Education and Research (FKZ 01LI1101 and 01LI1501) and the Barcoding Fauna Bavarica project (BFB) was supported by a 10-year grant from the Bavarian Ministry of Education, Culture, Research and Art.